Field of Green Video Slot Guide & Review - Casino Answers! Field of Green is a 5-reel, 20-line video slot developed by Realtime Gaming, featuring a wild substitute symbol, scatter wins, multipliers, a free spins feature, a bonus game and a progressive jackpot. You can play the Field of Green Real-Series Video Slot at Bovada. Field of Green is a football-themed video slot. The slot game is set on a video screen with the football field and the stands in the background. There is an animated blimp that flies across the screen at all times. Symbols on the Field of Green video slot are the Football, Football Player, Helmet, Whistle, Cheerleader, Beer, Foam Hand and Ace, King, Queen, Jack, Ten and Nine symbols. 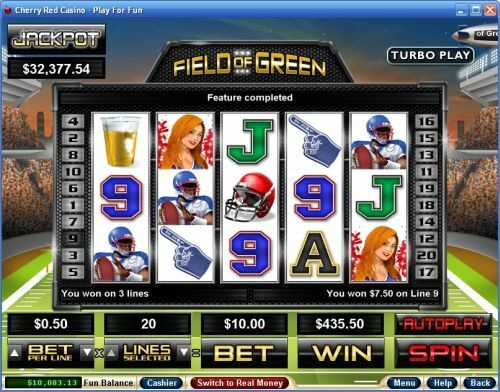 For a look at the Field of Green slot game, a screenshot is below. Bets on the Field of Green slot machine are $0.01, $0.02, $0.03, $0.04, $0.05, $0.06, $0.07, $0.08, $0.09, $0.10, $0.25, $0.50, $1, $2.50 and $5 per line. You can select from 1-20 paylines on a spin. You can play as little as a penny per spin up to the maximum total bet of $100 per spin. The betting range is extensive enough for casual players or high rollers. To manually skill stop the reels, you can hit the “Stop” button in the middle of any spin. To play the Field of Green online slot, press the “Spin” button. Field of Green’s wild symbol is the Trophy. It substitutes for all symbols except for the Scattered Football. It also acts as a multiplier and will double your winnings whenever it appears in a winning combination. The Football Trophy symbols does not pay out by itself on the Field of Green video slot. The top paying symbol on the Field of Green video slot is the Football Player. If you hit 5 of a Kind of this symbol, you will win 4000 coins. When you hit 4 Player symbols along with a Trophy, you will win 8000 coins. Other high paying symbols are the Helmet (1000/2000 coins) and the Whistle symbol (500/1000 coins). 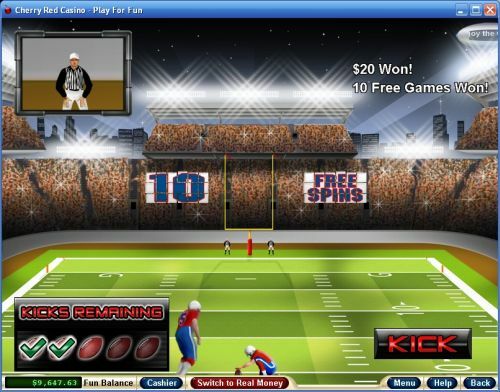 The scatter symbol on the Field of Green slot game is the Football symbol. If you hit 2 Football symbols from left to right or right to left, you will win 2X your total bet. When 3 or more Football symbols appear on the reels on the Field of Green slot machine, you will trigger the Field of Green bonus game. You will get attempt to kick one field goal for each Football symbol that triggered the bonus feature. For each successful field goal kicked, you can win up to 25 free spins or up to 100X your total bet. Free spins will be played with a 3X multiplier, so all of your winnings will be tripled. Free spins are played at the lines and bet of the triggering game. The bonus cannot be re-triggered. You can win big kicking field goals when you play Field of Green at Bovada. The progressive jackpot on the Field of Green video slot is currently at $32,377 and only going up from here. The Progressive Jackpot can be won at the conclusion of any game. The Field of Green jackpot is triggered randomly and is added to all other wins. Hit the “Autoplay” button to open the autoplay settings. You will be able to set the number of spins, set it to stop when the jackpot is won, stop if a win exceeds or equals (any amount you input), stop on any win, stop if your balance increases/decreases by any amount you input and stop once the feature is triggered. You can stop the Field of Green autoplay mode using the “Stop Auto” button to deactivate it. Turbo Play can be found in the autoplay settings. All Symbols pay left to right and right to left. Wins on different paylines are added. Scatter wins are added to payline wins. Payline wins are multiplied by the bet per line. Only the highest win is paid per line. Maximum win per paid spin is 50,000X bet per line. Field of Green offers an exciting bonus game where not only can you win cash prizes but free spins as well. I think I’d rather have the free spins most often due to the 3X multiplier, but I’m not entirely sure. Luckily, the game decides for you what your prize will be. In addition to the bonus feature, Field of Green has some good regular slot game payouts as well and a progressive jackpot, so it covers all the bases (oops, wrong sport). If you’re a fan of good ol’ gridiron action, you will want to play the Field of Green video slot at Bovada! Is there a free Flash game I can play of the Field of Green video slot? Unfortunately, RTG does not offer most of its video slots at its Instant Play casino. However, if you are in need of a USA-friendly video slot with a football theme you can play a Flash game of, please read our Pigskin Payout Video Slot Review or play it at Cocoa Casino. How do I trigger the Field of Green bonus game? The Field of Green bonus game can only be triggered when 3 or more Football scatter symbols appear from left to right or right to left. How can I win the Field of Green progressive jackpot? The Field of Green progressive jackpot can be won on any spin you make on the Field of Green online slot game. It is triggered at random. To increase your odds of winning the Field of Green progressive jackpot, we suggest raising your bet per line.